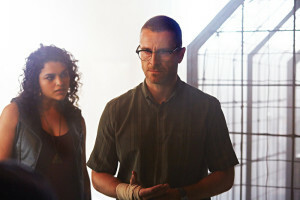 Syfy has released a few images and we also have a short description for tonight’s new episode of Bitten. Clay (Greyston Holt) and Philip (Paul Greene) must join forces in order to defend themselves from a few Mutt intruders. Want some pics? Here are a few. Actually, only two. And Laura Vandervoort is sadly not in either of them. What gives, Syfy? I guess we will have to be “settling” for these two pictures, since that’s all we’ve got.